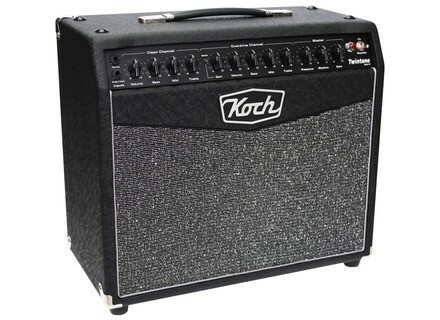 Twintone III, Tube Combo Guitar Amp from Koch. Koch Is In The House! 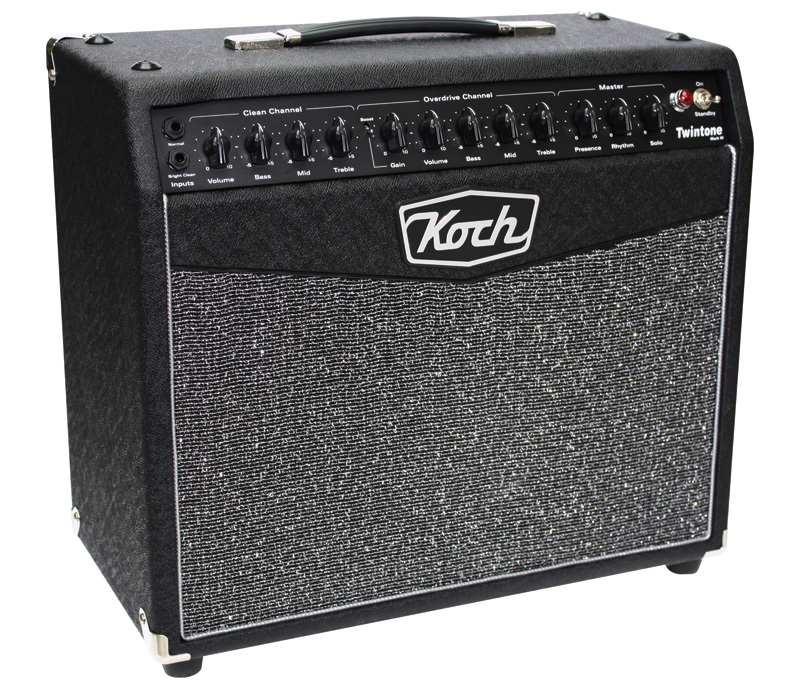 There are brands of guitar amps we see quite often in stores but we rarely try out. 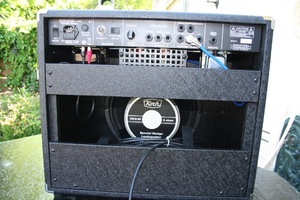 Any reason is good enough to skip such amps: no time, fear of the unknown, or simply no interest in testing new things. But this time, there's no excuse! I head out to the Netherlands. Rumors say Koch presents a new combo that is worth our attention. I take my hat, my whip and I head to the Netherlands. I grab my LP and off I go! I start with the clean channel. I leave the reverb and EQ neutral (12 o'clock). 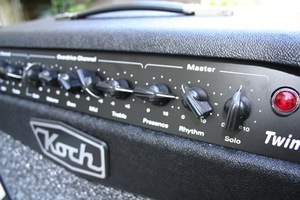 The amp produces a rich high-frequency sound without being sharp, the mids are present but have a slight lack of warmth. Even when you boost the lows, the sound stays "straight", modern and effective; it won't be everyone's taste. I boost the mid frequency range up to the max, set the treble control to 4 and switch to the bridge pickup. The amp doesn't sound sharp, the clean sound stays quite airy and well-balanced. I try out the solo control in the master section. This setting is common to both channels, which can be useful to control the output level of both arpeggios and chords. I switch to the lead channel. In spite of its origins, the Koch clearly shows a British character. I try to cut the mids and get a result that recalls the typical US rock sound. 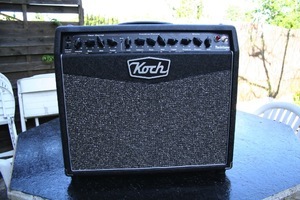 The gain headroom is quite large so the Koch will also satisfy heavy-riffing fans. Use the gain boost if you want even more distortion. Together with the solo in the master section, the gain boost will allow you to try out endless solos and tapping parts. 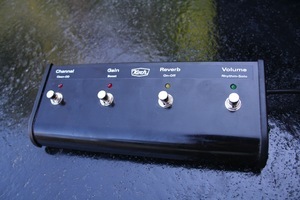 The lead channel is rather versatile and was a lot of fun with my Les Paul. In fact, the low-end is present without being muddy, and the amp sounds good with humbuckers without being too sharp. I also played the Koch with an Ibanez RG, a Fender Stratocaster and a Gibson 335. Every experiment was successful: the amp faithfully reproduces the spirit of each instrument. I like this amp for its sound and versatility. It's easily loud enough, even when you have a clean sound and play with a drummer. The master controls are very useful and will allow you to play in your apartment in spite of the 50 watts of output power. Every audio example was recorded via the direct out and a couple of mics (Shure SM 57 and Sennheiser e906) placed in front of the speaker. This is a real jewel that saw the light of day in the Netherlands. Regardless of your playing style, the Twintone will match your music. The amp has high distortion and loudness headrooms and it will satisfy demanding guitar players both in the studio and for rehearsals.